Athens, Ga. – U.S. Forest Service entomologist Jim Hanula may be the only person in the South who actually wants to keep kudzu alive. He needs healthy plots of the famous weed to monitor the effect the bean plataspid-a pest that entered Georgia some two years ago and has become known as the kudzu bug-is having on kudzu. “Kudzu is known as the vine that ate the South. The roots can grow 12 feet deep and weigh 300 pounds,” said Hanula, who has an adjunct appointment with the University of Georgia College of Agricultural and Environmental Sciences. Kudzu, and the new pest that feeds on it, came to the U.S. from Asia. The U.S. government promoted kudzu for erosion control in the early 1900s, and by 1946 the vine had spread or was planted on 3 million acres of land, he said. It now occupies 7 million acres and covers 50,000 new acres each year. Since the bean plataspid arrived in Georgia, Hanula has been knee-deep in kudzu patches trying to learn about the bug’s life cycle and behavior-and how it affects kudzu health. The pest eats the vine, but it overwinters on the bark of nearby trees. Those that survive winter lay eggs on kudzu in the spring. Their young, called nymphs, feed on kudzu and emerge as adults in late June and July. The insects then go through the same process again, with the next generation of adults emerging in September and October. “It is these adults that will overwinter and start the whole process next year,” Hanula said. Hanula has been taking weekly samples of the pest from research kudzu patches to study its biology. He and Forest Service entomologist Scott Horn tested a variety of colored traps to attract the bug and found it is not attracted to red, purple or black; it favors white most and yellow to some degree. This explains the hundreds of calls UGA Cooperative Extension agents receive from owners of white homes or cars. To determine how the pest damages kudzu, Hanula harvests the stems and leaves of infested kudzu patches and compares them to the patches he sprayed to protect them from the kudzu bug. 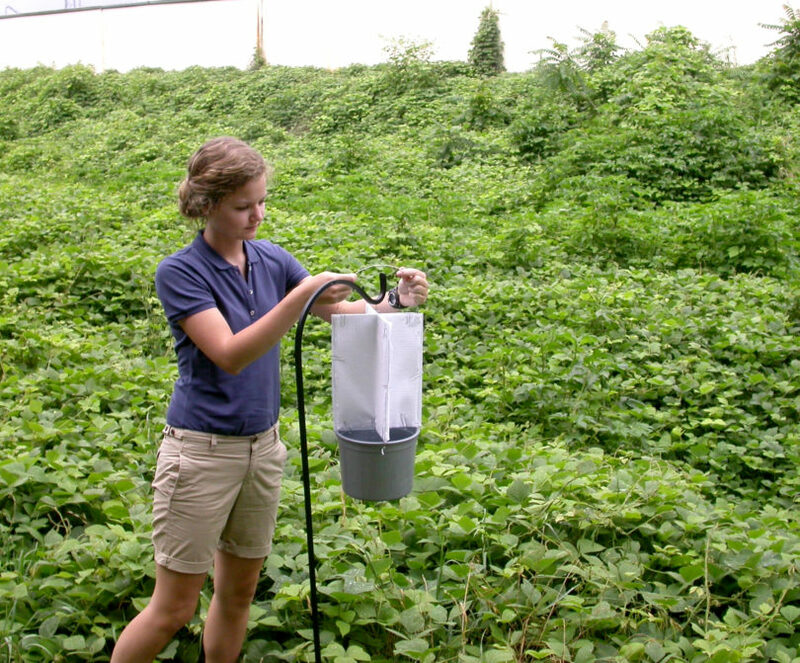 The Forest Service and UGA scientists hope continual feeding by the pest will deplete kudzu roots and weaken the plants. Much of the land now covered by kudzu is ideal for growing trees, so anything that slows kudzu growth is good for forestry, he said. Kudzu bugs dining on kudzu may sound like a reason to celebrate; the flipside is that the kudzu bug also loves to feed on soybean plants and other legumes. Georgia farmers grow soybeans for the oilseed and animal feed markets. UGA entomologist Phillip Roberts has seen the pest reduce soybean crop yield by 19 percent in untreated fields. On a positive note, the bug does not feed on soybean pods. The kudzu bug was first spotted in Georgia in the fall of 2009 when insect samples were sent to the UGA Homeowner Insect and Weed Diagnostic Laboratory in Griffin. The first samples came from UGA Cooperative Extension agents in Barrow, Gwinnett and Jackson counties. “As of now, the bug has been reported in 154 of Georgia’s 159 counties-only five along the coast remain unconfirmed,” said Wayne Gardner, a Griffin-based UGA entomologist who has been studying the pest since it was found in Georgia. The kudzu bug also has been found in all 47 South Carolina counties, 73 North Carolina counties, 25 Alabama counties, two Virginia counties, four Tennessee counties and six Florida counties, he said. “I think that’s 312 counties in seven states, which is a total land area of 147,342 square miles,” Gardner said. For tips on controlling kudzu or the kudzu bug, see www.caes.uga.edu/publications/ and search for kudzu or kudzu bug.